WAYNE’S WORLDS: Hawkman Has Taken Wing! I often like to say that there are no bad characters, only bad treatments of them. Well, a favorite hero of mine, Hawkman, is back, soaring in DC. And I couldn’t be happier! 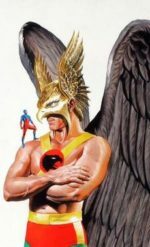 High-power scribe Robert Venditti is penning the new adventures of Hawkman. Venditti has most recently been writing Hal Jordan and the Green Lantern Corps, and did an excellent job of it. Many people consider it one of DC’s best comics. I happen to be one of them. As a long-time Hawkfan, it’s been tough to watch the hero struggle to gain his footing from time to time. When I first read him decades ago, he was less a Batman clone and more a Buck Rogers-alike. He went across the galaxy, encountering strange alien races and trying to fill in the gaps where the previously mentioned GL Corps didn’t seem to be around. But sci-fi fell out of favor, as it occasionally does, and Carter Hall spent nearly all of his time on Earth, serving as the head of an archeological museum. Granted, he still fought some way-out-there villains, such as the Shadow King, but he was planet-bound in much of his adventures. It did open the door for him to spend time as a member of the Justice League of America. Like most comics, bit by bit the creative teams seems to be less and less enjoyable, so he faded away. DC eventually decided it was time to make him less the reincarnation of an Egyptian pharaoh and more of an alien policeman. In came Tim Truman, who did Hawkworld, a series I liked, focusing on the Hawks on their home planet of Thanagar. Again, however, that ran out of gas. DC was in a quandry then. They had so many different versions of Hawkman around that no one could figure what to do with him. Enter Geoff Johns. He knitted all these various incarnations into a unified whole. And I was loving life. Yes, since he carried a mace, he was more barbarian than I had seen him before, but it was wonderful! However, it wasn’t long before Johns moved on to other projects, then Hawkgirl took over the book since she was pretty popular on the Justice League animated show, but even she couldn’t keep the series going. Then he literally died in a recent miniseries, but now, thanks to Metal, I have high hopes again for the Winged Wonder. After all, Venditti kept the Lanterns flying high after Johns left! I’d love it if lightning would strike twice! One of the problems I’ve had with some aspects of Hawkman has been that writers have often juiced him up too much so that he had what I call “Flash disease” – he was too powerful to be stopped. A case in point is the Absorbascon, a device that enables its user to telepathically read the minds of other sentient life forms – well, everyone except Thanagarians. This thing challenged people coming up with Hawkman stories because, well, how do you go against someone who knows everything you’re thinking? I haven’t heard mention of that device associated with the Winged Wonder for a long time, and I hope it either gets downpowered or ignored completely. I’ve noticed that this kind of thing was successfully employed on Superman. He’s not nearly the planet-pushing behemoth he was before. And I prefer him that way, though I know several who would rather he be an unbeatable powerhouse. Keep Hawkman vulnerable, yet formidable. That’s the challenge for Mr. Venditti today. It’s also important to show the Winged Wonder’s uniqueness. He shouldn’t be like Batman or Buck Rogers – somehow, he’s got to find his own niche instead of getting a “Hawk-cave” or a “Hawkmobile.” I think that kind of treatment for Green Arrow has haunted him, even to today. The notion of him being something of a barbarian still appeals to me, but he shouldn’t be too dumb. I hated it when Ultra Boy in the Legion of Super-Heroes was turned into a farm boy who was kind of thick in the head. This was done to differentiate him from Mon-El, who had similar powers. Now, as a fan of Ultra Boy, someone who had to have his wits about him so he could change powers at a moment’s notice, I truly disliked his dumbing down, especially since he should have been dead many times over if he couldn’t handle his powers correctly. Ah, well. I have often noted that just because you love a hero who isn’t around, you should still support him or her. A shining example of this is the Hawkworld Facebook group, run expertly by a gentleman named Tim Board. 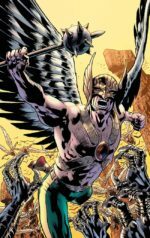 The people there have been keeping Hawkman’s fans energized for years, posting daily covers featuring the hero, talking about his adventures, taking polls, and keeping fans aware of what’s going on with the Big Guy. You can imagine that all this recent news has that group abuzz, and rightfully so. I’m also reminded of Hal Jordan’s crash and burn from galaxy-hopping hero to toy salesman to villain. When he faded from view, a group rose up to support him, and they kept the Ringed Wonder alive, even taking out full-page ads in industry magazines. Let’s just say that I’m sure they had a hand in raising Hal up to the stellar heights he’s enjoying today. So I say, if you love a hero or group, gather together with other fans and let the world know of your passion. It’s so worth it, although not every hero will be brought back to life (as much as we’d love them to be). I have been there with bells since that first comic featuring Hawkman hit the stands in June. And you can expect me to be supporting the Winged Wonder with each issue that follows. I can’t wait! Wayne’s Worlds: Crowdfunding Hit a Record in 2018!